5 Reels, 20 Paylines non-progressive video slot with Free Spins, Scatters and Stacked Wilds. Dungeons and Dragons Logo, Varick, Raelyn, Tordek, Copper Dragon, Crystal Ball, Dice, Fortress of Fortunes and playing cards from 10 to A. The Crystal Ball Wild substitutes all other symbols except the Scatter symbol. Land 5 scatters to be awarded 10 times the bet made on that spin. Get a minimum of 3 Dice to receive between 5 and 10 Free Spins with a multiplier from 1x and 3x. Players must choose which legendary hero they want to be - Tordek, Raelyn or Varick. The chosen hero will appear as a symbol in the game. Get 3 or more Dice symbols to activate Fortunes Free Spins Bonus game which begins with 5 Free Spins and a multiplier of 1x. Before the free spins begin, players will enter the Fortress of Fortunes game where they can earn extra free spins and multipliers. During the Free Spins, when landing another 3 Dice symbols more free spins will be triggered. Earn up to 180 free spins with a 10x multiplier. There are Stacked Wilds in every bonus reel with great rewards! Wins will increase when entering the Fortress Dungeon Exploration feature with 5 levels. In the Chamber, arrows appear which will be used to choose the direction to move in. Moving across the screen players may encounter a Gold Chalice for extra free spins, Treasure Chest for extra multipliers, Enchanted Weapon get one life point for chosen hero, Stairway which advances to the next level, Monsters to throw higher dice number. At the last level or the Dragon’s Cave players can get an extra 4x multiplier. 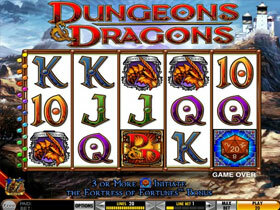 Another Slot in the Dungeons of Dragons Saga, but with tumbling reels.. 6 Free Spins will be awarded when the Bonus is activated.